Gandah, ever na nakita koh. Alah, cinabi ibang photographers. reminds me back na miss ko ang alon sa sabtang magaling talaga si Gelio.....sana makasakay ako sa falowa mo Gelio pag nagbakasyon ako.... great shot fren noli. kaydian ari kamu mangdet maychetas an kumwan abkas.ur a great sailor. saludo ako sa inyo. it really pays-off of all your hardwork... you really make your children proud!!! This photo is really good. Probably the best one for me among the others....Walang sinabi si George Clooney in Perfect Storm. hehe. Marvelous job for both Gelio and Noli. Cheers! FIRMI M KAPYAHEN SAKAYAN MO AYA MO GELIO TA PIAN MAY KMI PA JINIO JI SABTANG AW KUMTAS. i-sabtang karan ku as uyugan du vit, naypitdu akpava nakasivah su akmayas nia kawan an mian aw kapangwan kud sinakan da ama ku... we ivatans are strong and courageos people, just like our kamadids, that can withstand strong winds and waves... we are the true insulares. Gelio.. ari daw irang a mian su curuz du dichud.. makahawa ka daw..
makarwan mo pachi miñin mow..
this picture reminds me when im still in batanes.............. nice shot mr.noli gabilo!!!!!!!!!!!!!!!!!!!!! I have always wondered if there is a place in Batanes for surfers that will do anything to find a perfect wave. Perhaps my friends and I will visit Batanes next time we are in the Philippines. Probably time it during the typhoon season to get bigger waves. kaydian! ari ka mangdet mu gelio...imo pao nakaparin siao! piratang pirata ka! Its real....It reminds me of the dangers of crossing the channel specially when the waves are as if angry....or maybe not in the mood kaya...Anyway ang galing ng pagka-shoot mo kuya. reminds me back then an manayabtang ako an bakasion awri daw...what an adventure....great shot! 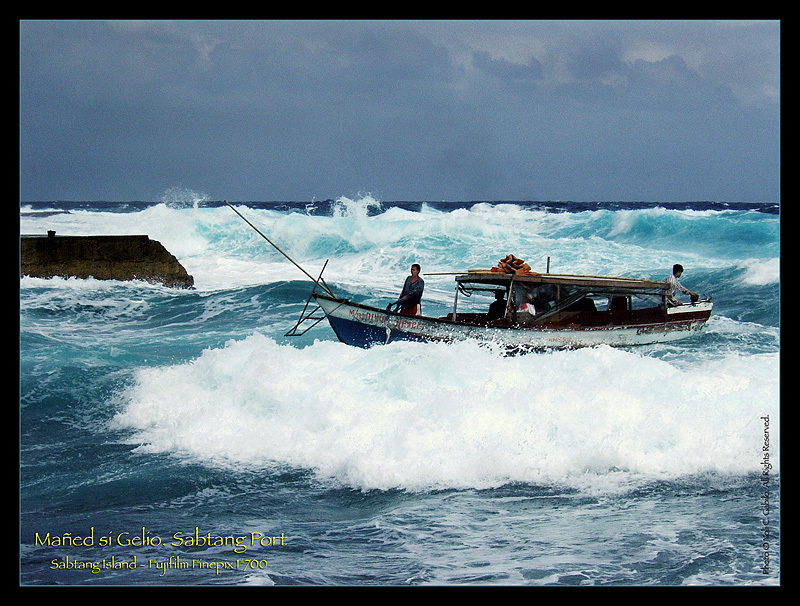 The art of sailing belong to those with brave & ever loving heart , No wonder Batanes sailors are one of the best , see this guys? not even typhone will stop them.